Many of the campgrounds inside Yosemite National Park require reservations. Reservations may be made up to FIVE months in advance. Starting the fifteenth day of each month, a month's worth of camping start-dates is available. For example, on January 15th, it is possible to make reservations with a start date between 15 June through 14 July. 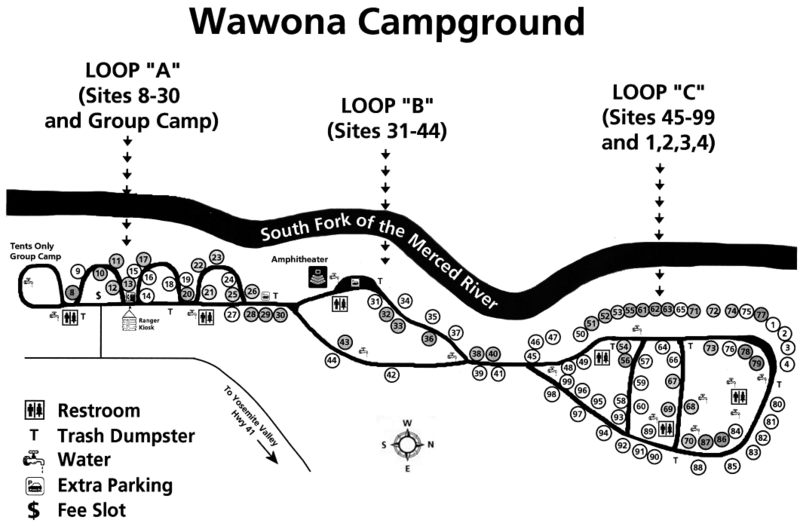 The Wawona, Tuolumne Meadows, and Hetch Hetchy Backpackers campgrounds have limited room for horse use. 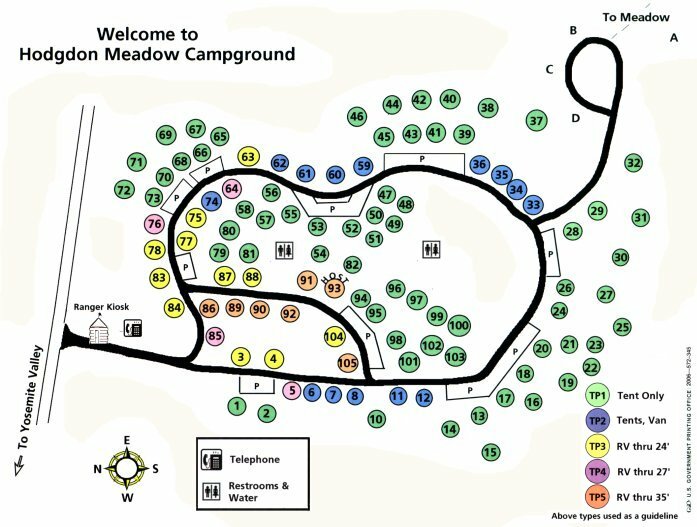 Group campgrounds are available in Yosemite Valley, Hodgdon Meadow, Tuolumne Meadows, Bridalveil Creek, Wawona, and Hetch Hetchy Backpackers. 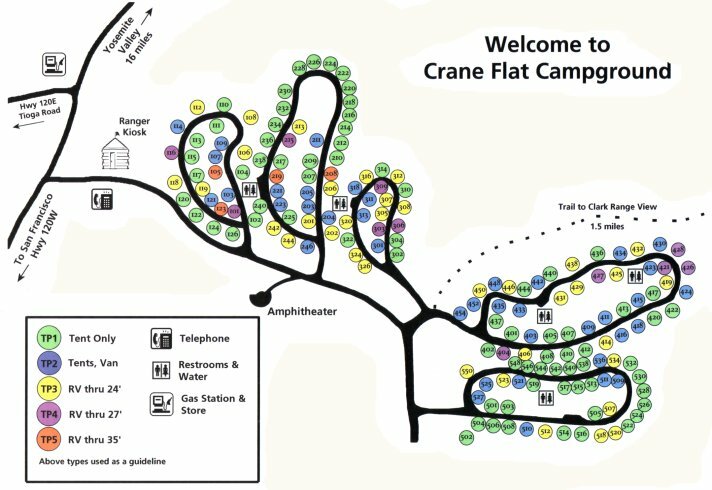 Each group site can accomodate 30 people. You may make reservations for Yosemite Valley, Hodgdon Meadow, and Tuolumne Meadows. 1-301-722-1257	National Parks Reservation System. 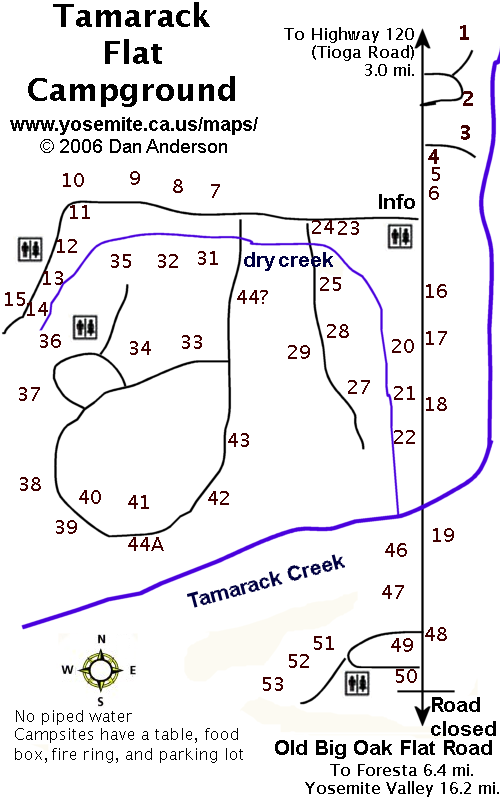 Campground reservations. http://www.recreation.gov/ for online reservations and information. 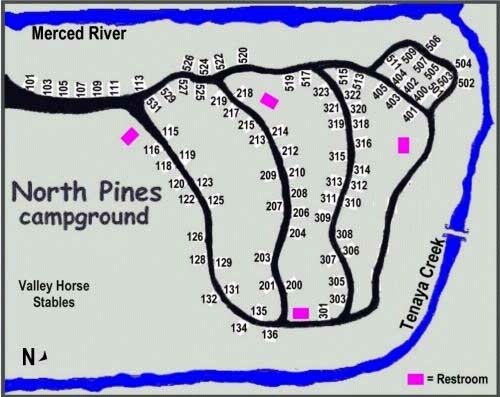 http://www.yosemitesites.com/faq/ for unofficial information on campground availability (by dates and campground). Camping is permitted only in designated campsites. Yosemite is BEAR HABITAT. Federal law requires that you PROPERLY STORE FOOD and other aromatic substances AT ALL TIMES! This includes ALL food (regardless of and including packaging), drinks, toothpaste, soap, cosmetics, etc. Proper storage means keeping ALL food, etc. in bear boxes at ALL TIMES. All campgrounds have bear boxes. Bears recognize ice-chests and many other types of food containers (including, for example, pizza boxes) and can easily break into your car to get them. Keep all food you are not actually handling stored in a CLOSED bear box. Your bear box MUST be closed at ALL times! NEVER leave food in your car overnight, under any circumstances. DO NOT FEED the animals! This includes squirrels, no matter how much they beg. Human food is unhealthy for wildlife and feeding of the wildlife makes them reliant on humans for food. FIREWOOD COLLECTION IS PROHIBITED IN YOSEMITE VALLEY. You may purchase firewood at Housekeeping Camp, Curry Village, and Yosemite Village. Outside Yosemite Valley, collection of DOWNED firewood is permitted. Do not cut down trees or remove branches from trees. CAMPFIRES are permitted only in fire pits. During summer, campfires are prohibited in Yosemite Valley except between 5pm and 10pm in order to reduce pollution. Before going to sleep or leaving the campsite, you must completely extinguish the fire. QUIET HOURS are from 10pm to 6am. Please show courtesy to your neighbors and refrain from making unnecessary noise during these hours (and during the day, for that matter). Generator use is permitted sparingly in most campgrounds between 7am and 7pm, though their use is discouraged. Please show courtesy to your neighbors and refrain from using a radio: it is very irritating to the hundreds of other people in the campground. CAMPING LIMIT: There is a seven-day camping limit in Yosemite Valley and Wawona between June and September, and a 30-day limit per year. The camping limit elsewhere is 14 days between June and September, and 30 days per year. 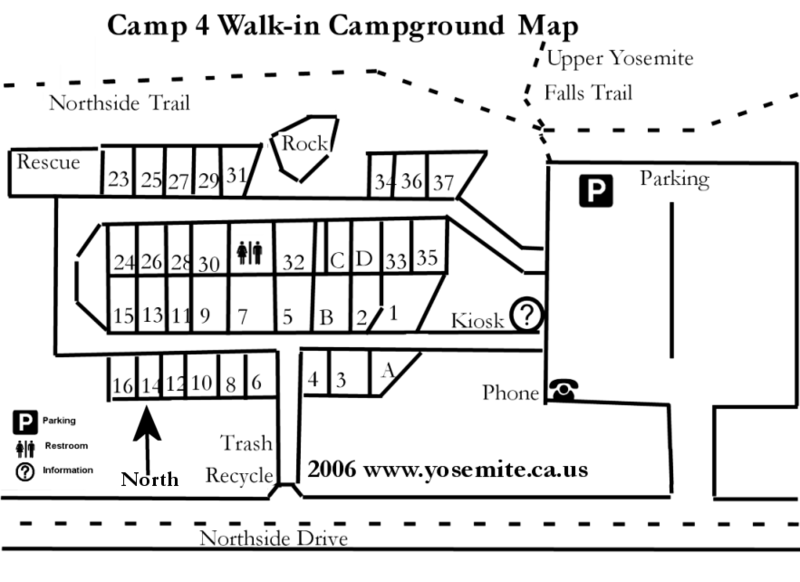 All car campgrounds in Yosemite have fire pits or grills, picnic tables, and food storage lockers (“bear boxes”). No campground has hook-ups. The maximum length for RVs is 40 feet. 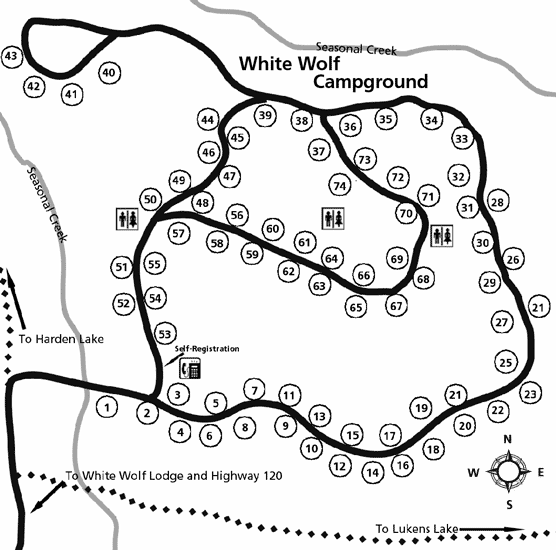 Many campgrounds have campground hosts. These volunteers are available to answer your questions and help you solve any problems. For law-enforcement or emergencies, and if a bear is in the campground, call 911. 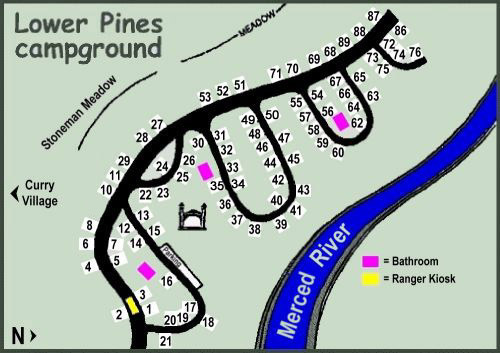 Upper and Lower River campgrounds were closed permanently after the 1997 flood. Whether these lost campgrounds will ever be replaced is still up in the air. Camp 6: "Camp Tresidder." Former employee camp south of Yosemite Village. Closed after 1997 flood; now a day use parking lot. 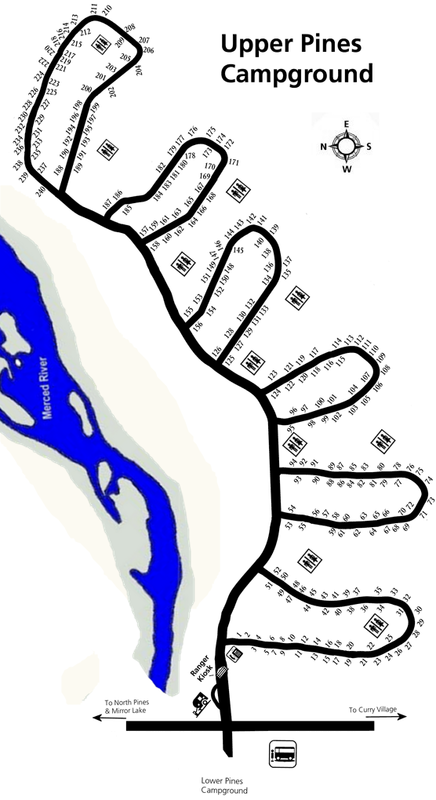 Camp 8: Later Kennyville (tent cabins). Located at present Ahwahnee Hotel before hotel was built in 1926. Camp 18: Former campground at current Yosemite Village post office and photo studio. Camp 19: Former Government employee campground between Sentinel Bridge and Housekeeping Camp; closed between 1968-1979. 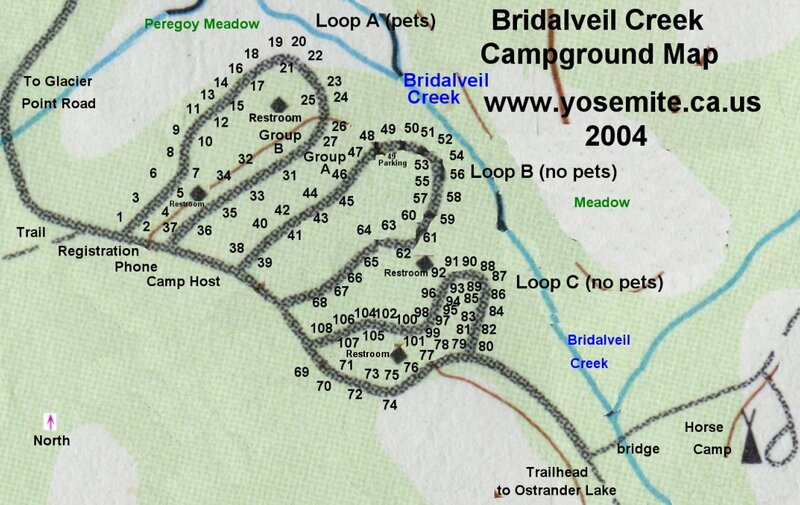 Camp 20: Former campground at Church Bowl between Yosemite Village and Ahwahnee hotel. Another Camp 20 was a 1930-era winter campground now known as Camp 4. Campgrounds Outside Yosemite Note: the rates are out-dated; please contact the campground operator directly. Accomodations within Yosemite range from tent-cabins in Curry Village to luxury hotel suites at the Ahwahnee Hotel. You may make reservations up to 366 days in advance, though it is generally possible to get some accomodations several months in advance without much difficulty, especially in winter. If you can't get reservations for the date(s) you want, you can try calling back a little later: cancellations are frequent. Alternatively, you can look at http://www.yosemite.ca.us/lodging.html and make reservations near the park. NOTE: If you have trouble getting reservations within Yosemite, try the motels and hotels outside Yosemite. Rooms may be reserved 1 year + 1 day in advance. Lodging is easer to reserve and often lower-priced off-season (mid-Sept. to Memorial Day, Sept to May). You will find that many of them are lower-priced and nicer than accomodations within Yosemite . . . and most of all, easier to reserve! Be sure to remove ALL food and other items with a scent from your vehicle. Do not store food and related items in a tent cabin-- use a bear box! Please see http://www.yosemite.ca.us/lodging.html for information about hotels, motels, and cabins outside Yosemite National Park. You can also make reservations there. Not all eating facilities are open year-round. Yosemite Lodge Pool (summer), and Ahwahnee Hotel (afternoons).